How does a Haitian-American kid grow up feeling privileged on certain levels with a beautiful home, sisters, grandmother, two middle-class parents, well educated, disciplined, and well-mannered to experiencing heartbreak, sadness, despair and loneliness? How does he have a father that has always been his guidance, protector and mentor, who then ceases to exist due to vices? Now, he must embark upon the journey alone to figure out his purpose all while being a man for his family. How does he cope with it all? Where does he find the answers? 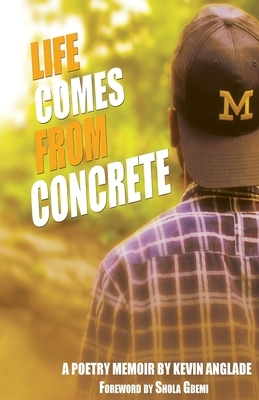 Life Comes From Concrete is the story of an NYC poet by the name of Kevin Anglade. Known as Kev Elev on stage when performing, LCFC tells the story of how an adolescent teenager transforms himself into a critical thinking black man living in America. This is Anglade's rite-of-passage documented in literary form through life and poetry. Kevin Anglade is an emerging writer, hip-hop poet, actor, and educator from Queens, New York. He published his first book, Tales of the 23rd Precinct (a short-story collection) through his indie press, Flowered Concrete in January of 2013. Moreover, Anglade was featured on NBC's final season of The Debrief with David Ushery in 2014 where he provided insight and purpose about his press as a small publisher in NYC. Prior to poetry, the artist got his start through acting, which he believes was the opening of realms that has led him into other artistic dimensions. Now 25, Anglade holds an A.S. in Theatre, (Queensborough Community College) a B.A. in English (Brooklyn College) and is currently pursuing his M.A. in English (Queens College). When he isn't writing or performing, the author enjoys music, a good ol' stand-up comedy routine and just about anything that keeps his heart light and void of harmful energy. Life Comes From Concrete is his first poetry memoir.